European Commission vice-president Viviane Reding has predicted that the eurozone will become a federal state, while urging the UK not to leave the Union. The Luxembourg politician in Cambridge University on Monday recalled a speech by Britain’s World War II leader, Winston Churchill, in Zurich in 1946. “In my personal view, the eurozone should become the United States of Europe. Like Winston Churchill, I believe that the UK will not be part of this, but it should remain a close ally with the federated eurozone, with which it would continue to share a common market, a common trade policy, and, hopefully, a common security agenda,” she said. Reding noted that euro countries have made an “extraordinary” leap in terms of integration due to the economic crisis. Reding also lambasted the quality of British debate ahead of its potential EU in/out referendum in 2017. She took aim at calls to curb immigration from fellow EU states. “Simply trying to project all problems on the supposed issue of too many foreigners moving into the country is certainly not the answer,” she said. She also warned that, with the UK “gradually, inexorably, drifting away” from the Union, it risks losing access to the “goldmine” of the single market and being taken less seriously by overseas investors. Churchill in 1946 said: “The structure of the United States of Europe, if well and truly built, will be such as to make the material strength of a single state less important.” He called on the then Soviet Union, the UK, and the US to be “friends” of the project. The Cambridge speech is Reding’s second high-profile visit to the UK after a debate in London on 10 February in which she also criticised British immigration attitudes. 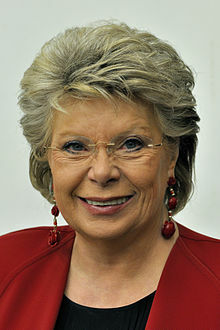 Open Europe, a London-based think tank which criticises deeper integration, at the time asked “Is Viviane Reding Ukip’s most effective recruitment sergeant?” referring to the UK Independence Party, which advocates Britain leaving the Union. Speculation grew last year she wants to be the centre-right’s candidate for the next commission president. But she said in January that she is backing fellow Luxembourger, former PM Jean-Claude Juncker, for the post instead. This entry was posted in International News and tagged Cambridge University, drifting away” from the Union, European Commission vice-president Viviane Reding, inexorably, Jean-Claude Juncker, the eurozone, UK “gradually, Winston Churchill by tamesidegreens. Bookmark the permalink.